Panelizing with 3rd party tool 'pcb-panelizer' from its-not-rocket-science? Since the initial topic is panelization, I personally use this program http://blog.thisisnotrocketscience.nl/projects/pcb-panelizer/ Sometimes a bit tricky to use, but it does the job. I am a new user, and I can upload one picture in a message. Panelizing dont work. I make the gerber and dril files and upload them to Panelizing. I get the following picture, what could be the problem? You might want to ask for help on the support forum of that tool. As I wrote earlier, it’s a bit tricky to use. I get the best results by using an auxiliary axis origin about 20 mm top-left of the board and output the gerber / drilling files by using this origin. If not, usually, your gerber files are offset from the view. Also, you must use the “protel extensions” and rename the .gm1 in .gko. Also, read the help file and this article https://hackaday.io/project/19202-small-pcbs-for-panelizing-tutorial/log/59210-panelization-using-gerberpanelizer-on-windows-linux-possible . It might help. Also, you must use the “protel extensions” and rename the .gm1 in .gko. Corrected the file extension, and it all worked. I will also try to run this program under the Linux operating system. Created a panel and uploaded to the site JLC. Why gerbera from the program and on the site do not match? Is it a bug or display problem?! Opened the generated files through the GerbView program and I see the following picture. Not all board shops show cutouts actually cut out on the website auto board viewer. You may need to double check with their customer service and/or technical support. Did you also import the Excellon drill file from the pcb panelization service? Did you get a drill file from the pcb panelization service? That’s where the drill info for the mouse bites (that is the actual technical term for the perforation drill hits for the between-board tabs) should be. I haven’t used that service so I could be barking up the wrong tree. But I have generated Gerber files for fabrication so I’m familiar with what is required by most board fabrication services. A third observation is the panelizer program may create a second drill file. Some tools will separate plated through holes (PTH) from non-plated through holes (NPTH). Mouse bites are NPTH, and the holes that I can see in your design are PTH. 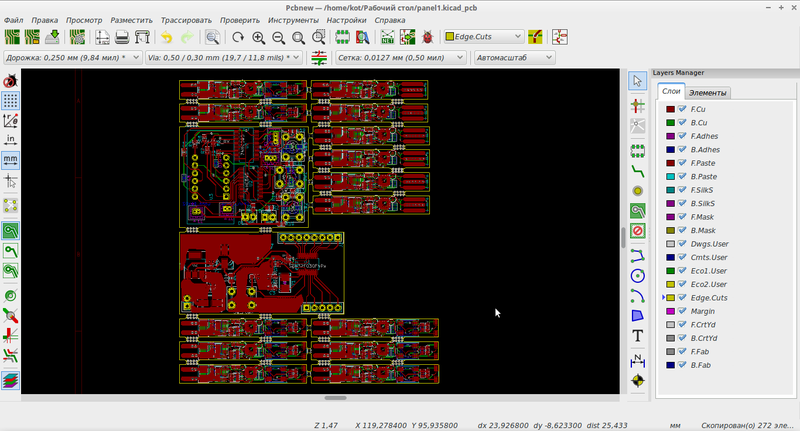 The JLCPCB viewer doesn’t display correctly the internal slots. I faced the same issue but my PCB were fine upon reception.